It’s that time of year again! We are 10 days away from the start of the 2016 football season, so now seems like an opportune time to start cranking out the “5 Things To Know” column which I started last year. During the season, these columns will focus on the opponents Texas State’s football team will be facing, but this week I’m keeping the focus on the Bobcats themselves. Training Camp has just about wrapped up, and the team is starting to take shape. 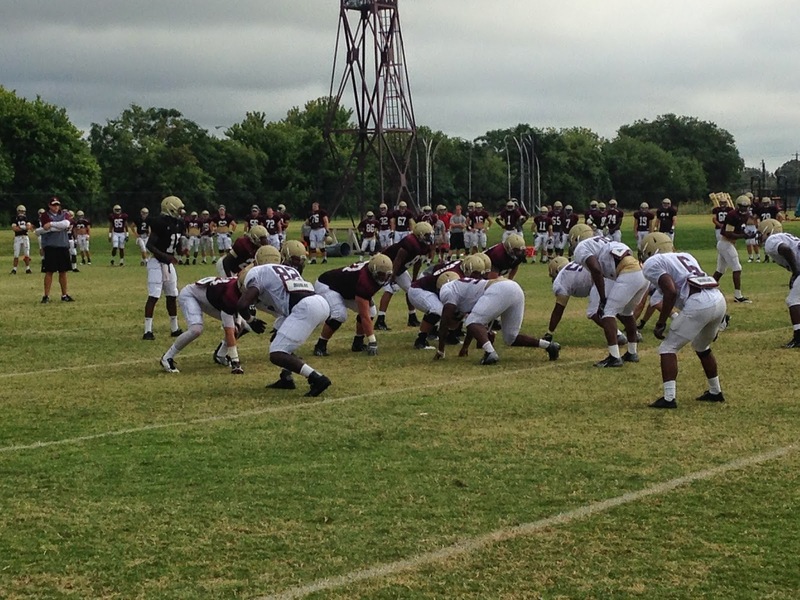 On Wednesday, the Bobcats held their final scrimmage of camp. The team is holding a “mock game” on Saturday, however, the goals of camp have pretty much been met. The install of the playbook is in, and most of the roles have been assigned. The last two and a half weeks have been dedicated to self-improvement and separating the wheat from the chaff, so much so that Ohio hasn’t really come up a whole lot. But that’s about to change. The Bobcats can finally start setting their sights on, well, the Bobcats. We’ll get to them next week. For now, let’s look back at training camp and see where things stand for Head Coach Everett Withers and company. At his post-scrimmage media session on Wednesday, Coach Withers announced that Tyler Jones will be the Bobcats’ starting quarterback and deservedly so. Despite being pushed at times by newcomer (and Missouri transfer) Eddie Printz, Jones has looked sharp throughout most of camp and had one of his best days during the Wednesday scrimmage. TJ didn’t have a strong finish to his junior season, and with the new coaching staff coming in, his job was far from safe heading into the spring. Yet, he’s continued to prove that he’s up to the challenge and continues to win the respect of his coaches and teammates-- the latter of which voted him as one of the team captains on Wednesday. As noted above, Jones did struggle towards the end of the 2015 season, but to be fair the same can be said about the team as a whole, and we’ve all seen what TJ is capable of when he’s at the top of his game. That of course is a clip from Jones’ 470 total yard, 5 touchdown day against Southern Miss from last season, one of the greatest single game performances ever for a Texas State quarterback. I don’t know if we’ll see 12 of those in 2016 but I think fans should be optimistic about the chances of seeing some games like the one Jones had against those Golden Eagles from a year ago. First consider his offensive coordinator and quarterbacks coach, Brett Elliott. At James Madison last year, Elliott served as Coach Withers’ co-offensive coordinator and QB coach and helped mold Vad Lee into arguably the best quarterback in the FCS. Lee led the FCS in total offense (375 yards per game) and in completion percentage (68.3%) and was named as not only the Colonial Athletic Association’s Offensive Player of the Year, but also as the best college football player in the state of Virginia. There’s been a pretty solid track record of Bobcat quarterbacks having stellar seasons as seniors wearing the maroon & gold. Take a look at the last three Texas State signal callers who served as the primary starters during their senior years. A few takeaways from that chart: 1) Nealy’s 3,932 total yards and 34 total touchdowns in 2005 are school records. 2) George averaged 286 yards of offense in 2009 which is also a school record. 3) Rutherford’s completion percentage in 2012 is the 2nd best in school history behind Jones’ 65.4% in 2014. 4) George didn’t run a lot. 5) Those pass efficiency ratings rank as the 5th, 7th and 8th best in the history of Bobcat football. It goes without saying that a senior year should be a player’s best let alone a quarterback but if anything, that should make you even more excited about TJ this year. We’ve seen some great football from him and more could be on the way. 2) Who else will have the ball in their hands this season? Good question. Consider the skill position players the Bobcats are having to replace: Robert Lowe and Chris Nutall at running back, Brandon Smith, Jafus Gaines and C.J. Best at wide receiver and Lawrence White and Ryan Carden at tight end. That’s over 8,000 total yards and 60 touchdowns worth of offense from their careers that’s now gone. Even if the Bobcats had a wealth of returning backs and receivers, there’s no telling what roles they would have with a new coaching staff. What the staff has had to work with is a mix of newcomers and returning players who were either redshirted last year or had minimal in-game experience. That led to a lot of shrugging of the shoulders by yours truly when asked who the playmakers would be on this year’s team. Now that training camp is essentially over, the picture of “what will this team look like” is now a lot clearer. Based on what I’ve observed, here’s a rough-draft look at the offensive skill position depth chart heading into next week’s season opener. A few notes here: this is in no way set in stone, and there have been a lot of moving parts throughout camp. Several of the “2nd and 3rd team” players listed above have run with the 1st team offense in camp. In fact, it’s probably more appropriate to list this as 1st Team-A, 1st Team-B and 2nd Team. I could easily see that group of 2nd team receivers getting ample playing time this season and the same goes for Siudzinski at running back. Siudzinski has the most game experience of all the running backs, and let’s not forget he torched Idaho for 170 yards in the Kibbie Dome last year. Two of the best players in camp have been Mayberry and Worrell. Mayberry had trouble getting playing time behind the likes of Lowe, Nutall and Terrance Franks the past couple of seasons, but with an open competition for the starting job this time around, he’s taken full advantage of the opportunity. Mayberry, who Coach Withers has called the team’s most explosive running back, seemed to separate himself from the pack early on in training camp and never let up. Meanwhile, Worrell has been one of the best stories of camp. A walk-on transfer from Allan Hancock CC, Worrell caught the attention of the coaching staff with his energy and enthusiasm and has proven he’s got some talent to go along with that fire. Worrell has gotten some time working with the first team offense and ripped off a long touchdown run during the Bobcats’ final scrimmage of camp on Wednesday. As for Tutt, the true freshman will be a factor in Texas State’s backfield as well. Tutt was one of the most highly touted players in Texas State’s signing class this past February and was an absolute monster at Keller High School. He’s also had some impressive moments at training camp and could be an offensive fixture for years to come. With him, Mayberry, Siudzinski and Worrell, the running back position, which was a question mark heading into camp, is now one of Texas State’s deepest on the roster. 3) Okay, but who’s blocking for them? Also a good question. Coach Withers has talked a lot about the team lacking enough “2s”, and I get the sense he’s referring to the offensive line more than any other position. The Bobcats lost Adrian Bellard, Zach Crawford and Brandon Sarabia to graduation. Several other offensive linemen left the program over the offseason. The coaching staff has had to convert a couple of defensive linemen to the offensive line just to have bodies. This is simply not a deep unit. However, one of Texas State’s best overall players is at the premium LT position: Ryan Melton. Guard Felix Romero is back from injury (torn ACL in the conference opener last year) and has proven to be a special player when healthy. Giuliano Cattaneo started eight games last season despite battling injuries of his own and will start at center. At the other tackle and guard positions, it appears starting duties will be held by sophomore Tryston Mizerak and redshirt freshman Jacob Rowland respectively. Beyond those five players, the offensive line is a mixed bag. Of all the positions Texas State can ill afford injury to this year, it’s this one. Whatever lucky charm you have, keep it with you at all times. 4) What will the defense look like in 2016? The easy answer is: a lot different. Putting aside personnel for a moment, simply seeing Texas State line up in the 3-4 will be a drastic change. I’ve been covering Bobcat Football since 2003, and this will be the first time I’ve seen a Bobcat team run the 3-4 defense. It’s not exactly a stat that can be tracked, but I’m curious if the program has ever run it. First-year defensive coordinator Randall McCray ran the 3-4 at Gardner-Webb. In three seasons, his teams had a penchant for stopping the run and getting off the field--two things Texas State’s defense struggled to do last year. Gardner-Webb held opponents to under 100 yards rushing 13 times in McCray’s three seasons. This past year, the Bulldogs had the third best 3rd down defense in the FCS, yielding just a 25.9% success rate to their opponents. Last year, the Bobcats surrendered 259 yards rushing per game (7th most in the FBS) and a 49.1% 3rd down success rate (5th highest in the FBS). McCray is here to help clean that up, and Bobcat fans should feel confident that he can. When he first arrived at Gardner-Webb, the Bulldogs had the most improved defense in the country in 2013, going from the 101st ranked defense to 5th in his first season. Fans wanting to see more turnovers forced by the defense should also feel good in knowing that in Coach Withers’ last eight seasons of coaching, his teams had a total of 122 interceptions. That comes out to 15 per season. Texas State had just three picks all of last season, so imagine what 12 more of those could do for a defense. As for the players, the “moving parts” mentioned in the offense above applies here as well. On the defensive line, Dallas McClarty will be the team’s starting nose tackle (one of the most important positions in a 3-4 defense), Jordan Mittie will line up at one of the two starting defensive end spots and you could see a mix of Dean Taylor and Ishmael Davis at the other end position. At OLB we saw some shuffling of the deck throughout camp. Towards the end of camp, a lot of first team reps were going to Easy Anyama and Gavin Graham with Kumonde Hines, Teron Fitzgerald and Karee’ Berry in the mix for the back-up spots. Frankie Griffin started camp as one of the starters but has been dealing with a concussion. Coach Withers mentioned in his post-scrimmage media session just how impressed he’s been by Graham and Hines, both true freshmen. On the topic of 1st year Bobcats, Gabe Loyd, a junior college transfer, has made an immediate impact on the team both on and off the field per Coach Withers. He’s a lock to start at inside linebacker for Texas State and could wind up as being the Bobcats’ best player on the defensive side of the ball this season. Opposite of him at the other ILB spot will likely be Bryan London, a redshirt freshman from Converse. 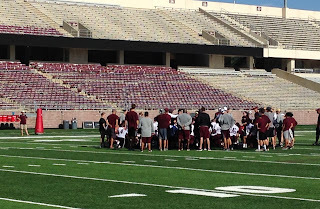 In Texas State’s secondary, the 1st team cornerbacks appear to be Brandon McDowell and Clarence Guidry while the safety spots will feature Javante O’Roy and either Damani Alexcee or Stephan Johnson as starters. The starting 11 on defense has a mixture of experience (McClarty, McDowell, Alexcee) and new blood (Loyd, Graham, London), so it’ll be interesting to see how it comes together. The 2nd and 3rd string units have been harder to identify, so again, depth could be an issue. However, if the starters stay healthy, Texas State’s defense has a chance to be a difference maker this season. Field position is always pivotal, and while the offense and defense certainly play a role in that, special teams is just as important. Texas State has weapons at its disposal on special teams to win those field position battles in punter/kickoff specialist Lumi Kaba and McDowell as a returner. Coach Withers has noted that McDowell will not only return punts this season, but will also likely add kickoff return duties to his job description. Kaba finished 2nd in the Sun Belt last season, averaging 44.3 yards per punt. He had 20 punts of 50 yards or more while also pinning opponents inside their own 20-yard line 19 times. Even in a tough defensive season like the one Texas State had last year, the numbers show just how crucial it is to make an opponent “work” for its points. Bobcat opponents scored 35% of the time when their drives started from their own 20-yard line or further back, but that number skyrocketed to 50% when starting a drive with less real estate. Kaba, named preseason 2nd team all-Sun Belt, has the leg to make teams work (and he can run too!). McDowell meanwhile has proven to be a great return man. His ability to create field position for the offense will be just as crucial as Kaba’s ability to help the defense. When the Bobcats started from their own 35-yard line or closer last year they scored 54% of the time. If they started behind the 35-yard line, that figure plummeted to 25%. McDowell and Kaba aren’t by any means the only ones responsible for field position but they play important roles. Also of note regarding special teams is that Tyler Watts will also get opportunities to return kickoffs and redshirt freshman Marcus Ripley will be the Bobcats’ place kicker. 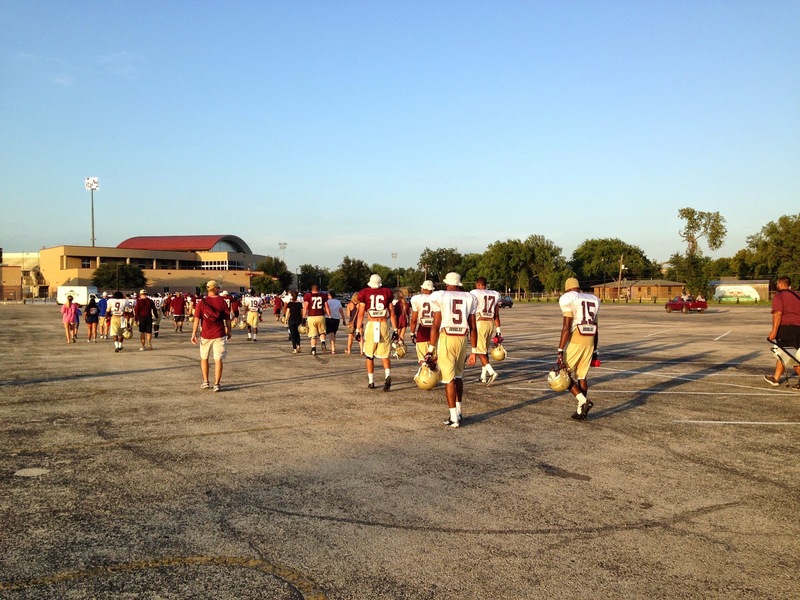 - Texas State could possibly make it through the season without wearing the same uniform combo twice. Tweaks were made from last year’s uniform set (and I’m not sure all of the team’s unis were included in that vine) and as you can see, there’s a lot of different looks the Bobcats could sport this year. Personally, I like the white helmet, maroon jersey, white pant look for home games and the white helmet, white jersey, maroon pant look for road games. - The team will also have two different sets of gloves to choose from this year. - The athletic year itself is already underway and off to a great start as Texas State Soccer is 2-0 after posting impressive wins over Lamar and Prairie View A&M. Both wins were by 2-nil scores featuring four different goal scorers and an advantage in shots of 53-8. 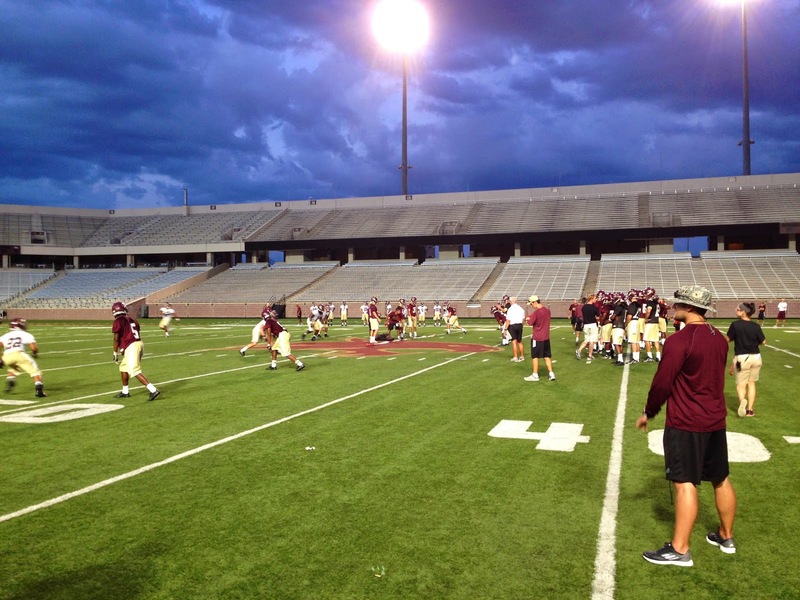 BTW, the last time Texas State started 2-0, the Bobcats won a conference title. - The Texas State Volleyball season starts this Friday at the North Texas Tournament in Denton and the Bobcats will face Ohio State in the opener. The home opener is this coming Tuesday against Baylor. No one ever accused Coach Chisum of putting together soft schedules and this year is no different. - The first Coach Withers Radio Show is this coming Wednesday at 7:30 at Chimy’s in downtown San Marcos. Once again, the radio show along with game broadcasts can be heard on our flagship station AM 1300 The Zone (Austin) or on affiliate stations 930 AM (San Antonio) and 89.9 KTSW (San Marcos, game broadcasts only, not the coaches show). To listen online click here. That’s all I’ve got for this week, next week’s it’s on to Ohio! Eat ‘Em Up!